As August wends its way and summer moves into autumn, I must record the joys of the community garden through these last sunny weeks. “We’ve not had much of a summer” is always the cry, usually based on the bank holiday weather, but we certainly couldn’t complain this August. Baking temperatures brought out the barbeques and blessed late summer celebrations. As I took inspiration from a beautiful cut flower garden, ‘Wild in the Country’ in Eyam, Derbyshire on Bank Holiday Saturday, I floated on a cloud of wellbeing! On our doorstep at St Mark’s the garden is ripening. 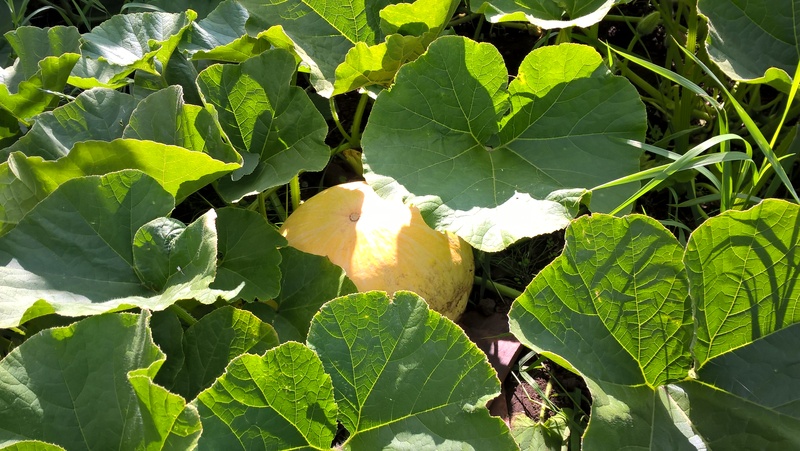 “Where’s that come from!” someone remarked, as a large pumpkin poked out from the undergrowth. We’ll have a fine display for October 8th when we celebrate our Harvest Festival. See how many pumpkins you can spot before we pick them in late September. Incidentally I’ve discovered from one of our African friends that the leaves of the pumpkin are a great delicacy and very nutritious. The brightly coloured ‘Bishop’ and ‘Bishop’s Children’ dahlias have been lovely, their flowers set against dark foliage. Most of us think of big showy dahlias but these little beauties prove that the simplest things can have a huge impact. There have already been some good windfall apples from the four espaliers, Jonagold, Katy, James Grieve and Charles Ross. 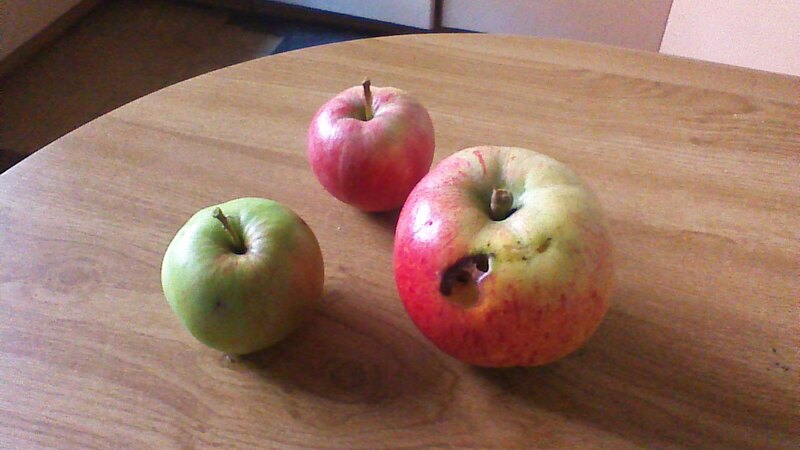 They’re fine if you cut out the protein (slugs and woodlice) and I’ve used several (apples that is!) in blackberry and apple cake, one of which was shared with Pam and Phil Bishop in Liverpool. Our young people planted a lot of courgettes along with the pumpkins and now we have GIANT marrows! The runner beans planted by the Under-Fives are also going strong. It’s a shame the youngsters aren’t around to reap the rewards but maybe when they return next week they can open the pods and pick out the bulging pink seeds to dry for next year’s sowing. We plan to let the children empty the seed heads from love-in-a-mist and other annuals as well as picking the papery everlasting helichrysum to decorate the tables in the hall over winter. The garden is always full of hope. Talking of hope, it would be good to make the driveway look a bit tidier before 25 September so maybe we could have a Big Weed as well as a Big Clean. Any volunteers will be welcomed with open arms. Sheila and I are in the garden each Monday 9.30-11.30am. 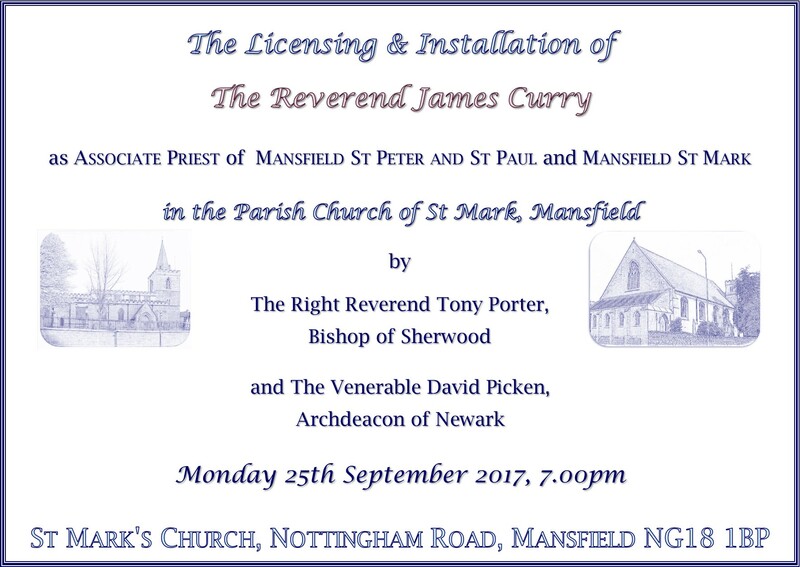 Do come and join us!